The integration of new sources of energy like wind power, solar-power, small-scale generation, or combined heat and power in the power grid is something that impacts a lot of stakeholders: network companies (both distribution and transmission), the owners and operators of the DG units, other end-users of the power grid (including normal consumers like you and me) and not in the least policy makers and regulators. There is a lot of misunderstanding about the impact of DG on the power grid, with one side (including mainly some but certainly not all, network companies) claiming that the lights will go out soon, whereas the other side (including some DG operators and large parks of the general public) claiming that there is nothing to worry about and that it's all a conspiracy of the large production companies that want to protect their own interests and keep the electricity price high. The authors are of the strong opinion that this is NOT the way one should approach such an important subject as the integration of new, more environmentally friendly, sources of energy in the power grid. With this book the authors aim to bring some clarity to the debate allowing all stakeholders together to move to a solution. This book will introduce systematic and transparent methods for quantifying the impact of DG on the power grid. MATH H.J. BOLLEN, PhD, is Senior Specialist with STRI AB, Gothenburg, Sweden; Professor in Electric Power Engineering at Luleå University of Technology, Skellefteå, Sweden; and a technical expert with the Energy Markets Inspectorate in Eskilstuna, Sweden. He is a Fellow of the IEEE. FAINAN HASSAN, PhD, is with the Alstom Grid (previously Areva T&D), Research & Technology Centre, Stafford, United Kingdom. A member of the IEEE, she has also worked as a seniorengineer for STRI AB, Gothenburg, Sweden. The author’s organization of the book is superb, and the write-up with appropriate examples is very clear. The book will be useful to those who have good prior knowledge in power engineering including power electronics and renewable energy sources. 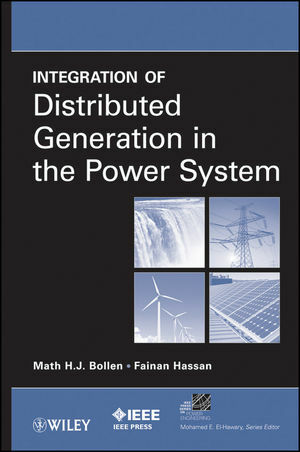 The book offers a very comprehensive discussion of modern power system operation with distributed generation by renewable energy sources. It describes sources of energy, power system performance, overloading and losses, voltage variations, power quality disturbances, faults and protection, and transmission with distributed generation. Many examples are given with emphasis of European system. It is an excellent reference book for modern power engineers.